There’s nothing, thankfully, quite like Vietnamese rice wine. It’s inescapable. You’ve done your best to outrun it but to no avail; its shadow now looms large. Feeling its hot breath on the back of your neck, you resign yourself to your fate and turn to face the demon that is all but at your heels. Staring it square in the face, you confirm your worst fears. You are going to be forced to drink a lot of “ruou” at this lunch party. Seemingly, no Vietnamese gathering, be it the celebration of a child’s birthday or the anniversary of a family member’s passing, is complete without a sea of red faces and the shattering of tiny drinking vessels. While beer can certainly be a contributor to the aforementioned scene, it is, at most, an accomplice. The chief perpetrator, the mastermind behind the downfall of Vietnamese men (and it is almost always men) young and old, is Vietnamese rice wine, or “ruou gao”. Despite your protestations that you have work to do later on in the day, the repurposed La Vie bottle containing some unidentifiable liquid hits the table and the set of comically small shot glasses is brought out. A cursory sniff reveals that the beverage is safe for human consumption, probably. The pouring begins and before you know it you’re caught up in round after round of the mystery liquor, desperately trying to take in as much food as possible in between sips so there’s at least something in your stomach to soak up the alcohol. Between both group toasts and private toasts and familiar cries of “tram phan tram!” (100%! ), you receive compliments from your dining companions about your drinking ability. Buoyed on by the praise, you start to get into the swing of things and, dare I say it, even start enjoying the once barely palatable taste of the homemade firewater. Before you know it, the meal is over, several empty bottles lay strewn across the table and it is only when you rise from your plastic stool that you come to the realization that it’s not even 1 in the afternoon and you’re uproariously drunk. Although it’s the traditional booze of choice from countryside to city, mountain to sea, Vietnam’s contribution to the world of spirits can take some getting used to for the uninitiated. It could be said that it is an acquired taste but the truth is a little more complicated. The fact is, due the nature of how it’s made, there is an incredible amount of variation from one batch to next. Freshly cooked rice is mixed with yeast and then left to ferment over the course of several days. After this waiting period, the resultant mixture is then heated again to produce the desired end product. The whole process, from start to finish, is still predominantly carried out by small-scale distillers rather than large corporations. This means that everything from flavor profile to alcohol content can differ wildly, and no two jars are ever quite the same. Every time you drink a bottle, you are effectively playing Russian roulette, as it is a complete crapshoot whether its contents will leave you slightly merry or completely horizontal. The real adventure begins, however, once you leave the city limits and venture into the more rural parts of Vietnam. The further away from urban areas you get, the more home brewers you run into, all insistent that you try their personal concoctions. It’s no secret that the best tasting “ruou” comes from the countryside, as city folk never fail to return from their visits to their hometown without a few bottles of the good stuff. And anyone who has been on a bike trip will know that no matter which part of the country they are in, stopping in one of the smaller towns or villages will soon or later end in rice wine being proffered, like an inevitable boozy punctuation mark, breaking up the journey for the road-weary. Those traversing the northern regions of Vietnam might be treated to “ruou nep cai”, which is noticeably sweeter, more fragrant and goes down a lot easier than standard “ruou gao”. 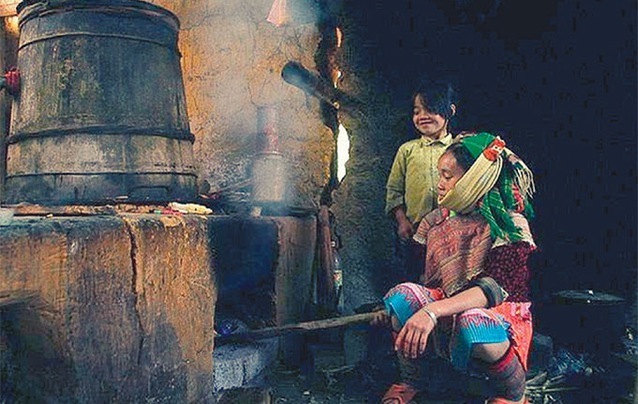 However, those in search of something even more saccharine would be wise to pay a visit to the mountainous areas populated by Vietnam’s ethnic minorities, where they might be fortunate enough to be invited to partake in “ruou can”. The drink itself is intensely sweet yet deceptively strong, but what really makes it special is the method of consuming it. The rice wine is served in a large, deep clay pot placed in the center of the group. With the help of long bamboo straws, everyone drinks straight from this communal vessel until it is all gone. A truly enlightened way of fostering a feeling of community that a lot of Western companies could learn a thing or two from. For those who want to sample some decent “ruou” but find themselves confined to the city, not to worry, there are still some great options. Although the The House of Son Tinh is no more, Dan Dockery and Markus Madeja’s internationally acclaimed “ruou Son Tinh” can still be enjoyed at any of their Highway 4 restaurants. A great choice for people who want to sample a large selection of infusions is Ray Quan, which has the added benefit of being open late, should one bottle turn into three or four. Finally, for a real local experience, there is no place better than Tam Phuong Quan, another late-night joint, frequented almost exclusively by Vietnamese, which offers one of the wider range of choices in town. One aspect of “ruou” often overlooked by foreigners is the idea that certain types are believed to be imbued with medicinal properties. It is not uncommon to see whole snakes or geckos entombed in large glass containers, offering up their supposed virility-enhancing abilities to any young man brave enough to sink a shot or two of the elixir. Slightly less gruesome are the plant and root infused varieties that can contain a whole host of different comestibles, from something as mundane as artichoke to an entirely exotic ingredient like the intensely aromatic Buddha’s hand, but all of which are created with some health benefit in mind. One slightly worrying trend I have started seeing recently is that at the last two family functions I attended, “ruou gao” lost its place at the table and was replaced by Japanese whisky. While no doubt delicious and certainly several magnitudes more expensive, the meal wasn’t quite the same without Vietnamese liquor. As the country as a whole becomes more affluent, it would be something of a shame if that led to a decline in the popularity of Vietnamese rice wine in favor of imported spirits. Vietnam and rice wine are inextricably linked in my mind and I hope they remain entwined for many generations to come. Bien Hoa ceramics first found fame a century ago and remain much-admired locally and internationally.